I´m from Brazil and I teach English at private schools. I teach kids and adults as well, but kids most of my time. It´s not an easy job but very rewarding. I also love drawing and pets. I will try to be as helpful as possible! 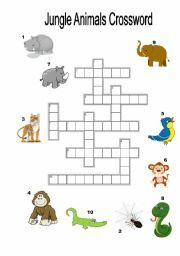 Students complete the crossword with the names of jungle animals. Good for children. This powerpoing game contains 10 different illustrations of free time activities and sports. Students have to choose the correct option. Teachers may want them to come up with a sentence using the expression: "I like to play hide and seek in my free time." This is a game to present or recycle vocabulary related to jobs/occupations.